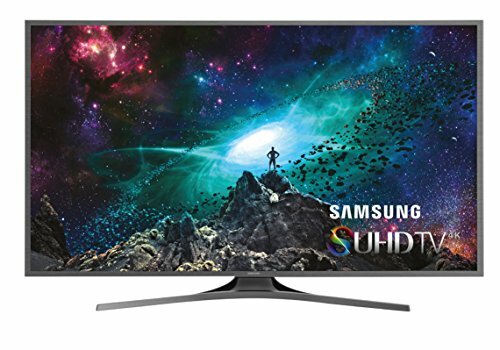 This TV is a part of Samsung’s JS7000 series, more affordable SUHD LED TV from this manufacturer that boasts some great picture features at a great value price. We will explain the difference between a UHD TV and an SUHD TV later on. But, the main difference, for practical purposes, is the picture presentation. This model, being an SUHD TV boasts light flow-through, more vibrant colors, but maybe a bit more uniformity issues and artifacts as well as lower contrast than some of the top UDH televisions. The blacks and the screen uniformity are not as strong as with UHD models, but the overall picture quality is pretty similar. Side angle viewing with SUHD TVs is much better than with UHD TVs due to the IPS panel. The Samsung UN60JS7000 has very low motion blur, so it is perfect for gaming purposes, as well as for watching sports. Let’s take a closer look at some of the most important aspects of this TV. SUHD is a way to spice things up a little bit when it comes to certain picture quality aspects on TVs. The “S” in SUHD stands for Super. So, here is what makes an UHD television an SUHD television. To start with, SUHD TVs like this one we’re talking about, use new color system called DCI P3 that has a wider color pallet (bigger range of colors). That color is additionally enhanced and dispersed by Nano Crystal Technology. The combination of these two really improves the color that comes across cleaner, more defined and refined than the previous 4K televisions. However, there’s a bit of an offset with the UN60JS7000 because colors are a bit hurt by this TV’s lower contrast from its IPS panel. Furthermore, the SUHD models boast a brighter backlight that is able to hit 1000 nits at peak brightness, as well as to produce deeper blacks. These LEDs are an important part of the reason Samsung UN60JS7000 is a great daytime TV. Finally, even though this isn’t difference between an SUHD and UHD TV, it is pretty important to mention that almost all Samsung’s SUHD TVs boast the Tizen operating system for Smart television developed by Samsung. Overall, SUHD TV is all about upgrading picture quality features, particularly expanding color spectrum. If you want to watch 4K content, the best option right now is web streaming, and this model of TV is able to display the streamed TV series and movies available from Amazon Instant Viseo and Netflix without the need for any additional gear, thanks to the “HEVC” decoding included with the Samsung UN60JS7000. This TV set boasts 4 HDMI inputs, and all of them support HDCP 2.2 copy protection meaning you will be able to enjoy UHD sources such as 4K Blu-ray movies once they arrive at the end of this year. Even though true UHD content is still to arrive, that will not keep the customers from enjoying an incredible picture. 4K upconversion is Samsung’s top priority since they produced the video processing circuitry for this model. Any signal is automatically upconverted to match the 4K resolution of the screen by their UHD Upscaling. Satellite or cable TV box, Blu-ray player, game console, or any of your video sources will look better than ever. A really rapid quad-core processor is the Samsung UN60JS7000’s brain which allows you browse the internet without the need to stop what you are watching. Not only can you surf the web, but you can also do other things such as download one app while using another, or multitask. The AllShare Play feature allows you wirelessly stream and access content from any of the compatible devices. Those who have a Tab or a Samsung Galaxy smartphone can share photos, music, movies via this TV.